Visit the National Constitution Center to find the answers to the questions on your scavenger hunt. On a Web page, main topics are links to information. 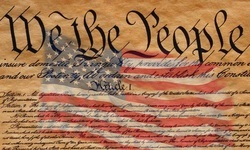 Browse the main home page of the National Constitution Center to see what main topics are listed. Decide which link is most likely to take you to the answer to your question. Glance over the new page to see if you can find the answer to the question OR if you need to link to another page. Some questions have their own links within the National Constitution Center's site. Be sure to scroll down and view the WHOLE page when looking for links to the answers.